My "official unofficial" discussion forum! I was born in St. Paul, Minnesota on April 2, 1978, the first of three brothers. I've lived in the Minneapolis/St. Paul area my entire life; currently, I'm just across the border in Wisconsin, about half an hour east of the Twin Cities. 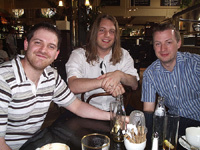 The Lies of Locke Lamora, my first novel, was bought by Simon Spanton at Orion Books in August, 2004. Prior to that I had just about every job you usually see in this sort of author bio-- dishwasher, busboy, waiter, web designer, office manager, prep cook, and freelance writer. I'm very much your standard-issue geek-of-all-trades; I like history, literature, films, contemporary and classic Macs (huzzah beige boxes! ), gaming, and game design. I collect old Choose Your Own Adventure novels and Infocom text adventure games. I'm also a volunteer firefighter. I was initially trained and certified in Minnesota, and have served in Wisconsin since 2005. In April, 2010, my wife and I separated after four years of marriage. Me in my fire gear, New Year's Day, 2006. 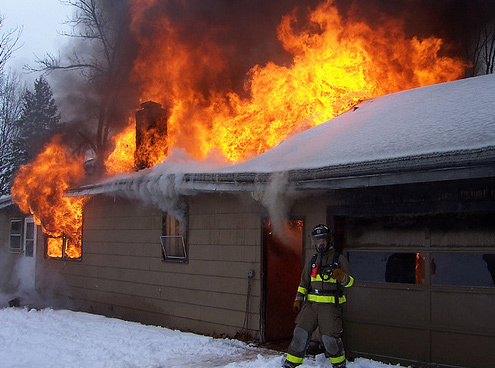 The house was burned for training purposes. Honest. A working (I swear!) lunch in Bristol with Joe Abercrombie (left) and Dave Bradley (right) of SFX magazine. June, 2006. All site contents © 2009 Scott Lynch except where noted. Unauthorized reproduction and similar monkey business expressly forbidden. What? You don't think I'm serious? I'm an author, man. Don't mess with me. I'll give you such a paper cut.